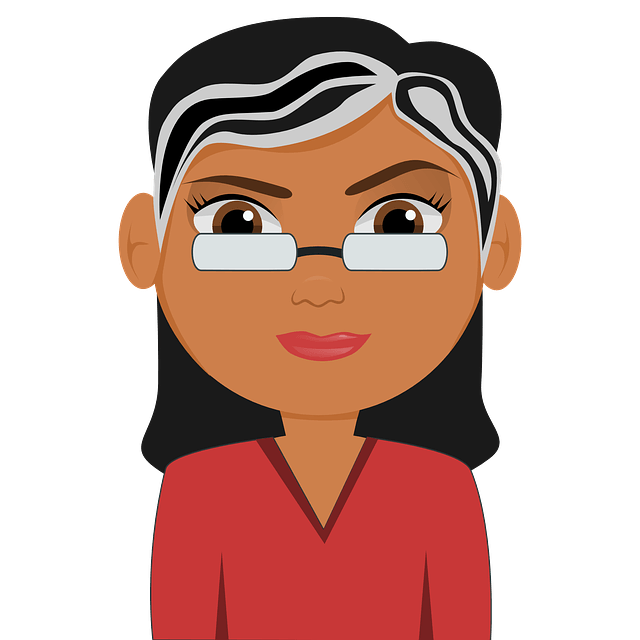 Dark, chapped and dull lips – the worst nightmare of any woman or girl, isn’t it? No doubt, rosy and natural lips are the most appealing feature of a girl or woman. Excess smoking, caffeine consumption, genetics, sun exposure, lip misbehavior and harsh chemicals present in lip care products turn your rosy lips into withered blooms. Though most of the commercial products promise to bring back life to your lips, none of them live up to their claim and harshness of the chemicals makes them the worst option to choose from. Pink and soft lips – if this is your dream, then we have come up with an incredible home remedy for dark lips. And that’s none other than – “Lemons”. Is Lemon Good For Dark Lips? The bleaching property of lemons lightens the skin. The healing property of it treats chapped lips. As a natural cleanser, it removes the accumulated dead skin cells and clears dirt. Vitamin C present lemon reduces melamine production. Its acidic nature kills the bacteria causing discoloration. 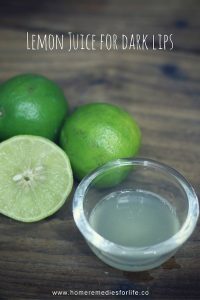 Take few drops of lemon juice and apply it on lips. Leave it for 30 minutes and rinse off with water. This process helps to exfoliate dead cells and helps production of new and healthy cells. Slice a lemon and sprinkle sugar on top of it. Gently massage on lips for few minutes. Alternatively, use brown sugar instead of table sugar. This process helps to remove tan efficiently from the lips. Combine 1 1/2 teaspoon lemon juice and 1 tablespoon of glycerin and honey. 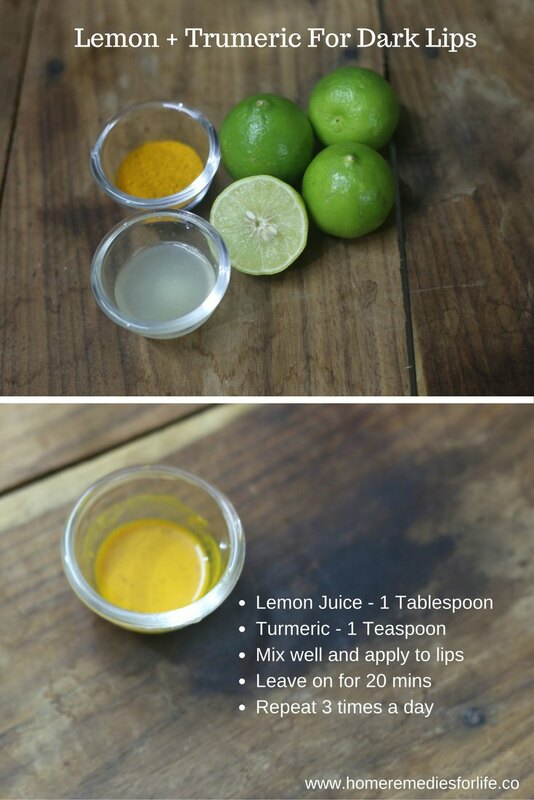 Apply the mixture on lips before going to bed. Rinse off with water next morning. Alternatively, you can exclude glycerin. Mix 1 tablespoon each of lemon juice and castor oil. Combine equal amounts of lemon juice and yogurt. Apply the mixture on lips and let it rest for 20 minutes. Almond oil nourishes and moisturizes the skin on lips. Mix equal amounts of lemon juice and almond oil. Apply on the lips and gently massage for 3 minutes. Let it rest for 40 minutes and rinse off with water. Raspberries give color to your lips. Combine equal amounts of lemon juice and raspberry sauce. Gently massage the mixture on lips for few minutes. Let it rest for 25 minutes and rinse off with water. Turmeric acts as anti-microbial and kills bacteria causing discoloration. Make a mixture combining 1 tablespoon lemon juice and 1 teaspoon turmeric. Apply the mixture on the lips and let it rest for 20 minutes. Melt 2 tablespoons beeswax using a double boiler. Add 1 tablespoon olive oil and few drops of lemon essential oil to melted beeswax. Stir well, remove from the flame and pour in an airtight container. Let the mixture cool down and use regularly as a lip balm. The astringent properties of cucumber lighten and tone the skin. 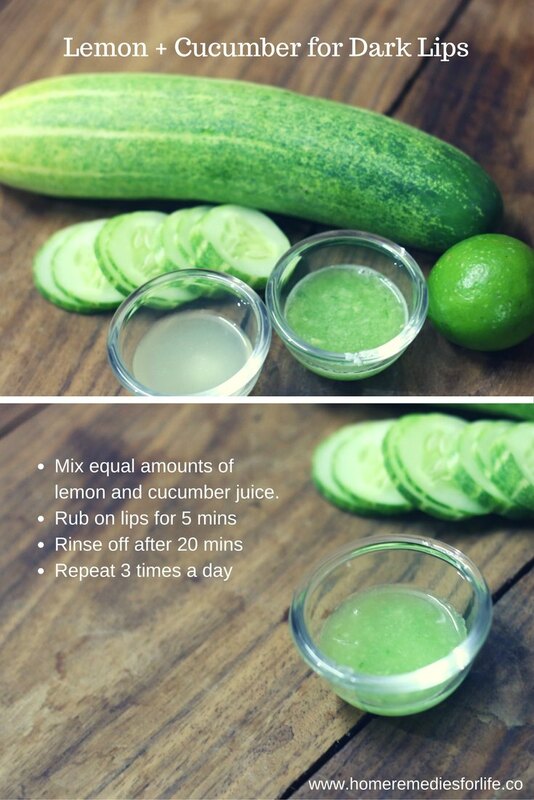 Rub the mixture on lips for 5 minutes. Mix a dash of lemon juice with 1 teaspoon egg white. Apply it all over the lips and let it rest for 20 minutes. Milk cream moisturizes and softens the lips. Add 4 drops of lemon juice in 1 teaspoon of fresh milk cream. 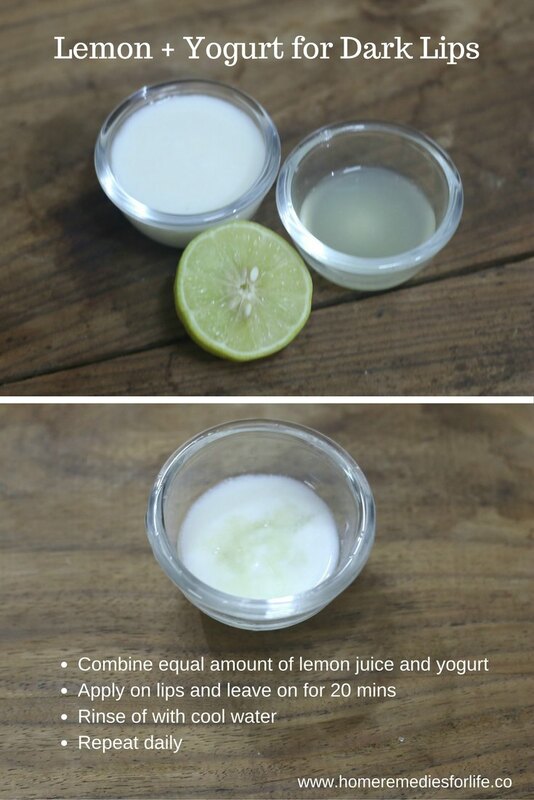 Apply the mixture on lips and massage gently for 3 minutes. Let it rest overnight and rinse off next morning. Don’t apply any remedies if you have chapped or cracked lips. Heal them first. If you are intolerant to the acidic nature of lemons then dilute it with water. If you are allergic to citrus fruits, avoid lemons. Do a patch test before regular treatments. It is better to apply above methods during nights as lemon juice makes skin photosensitive. Avoid sunlight exposure for 5 hours after treating with lemon juice. Use a lip balm with good sunscreen to avoid tan caused by harmful rays of the sun. Limit coffee and tea consumption. Remove lipstick before going to bed. Use a lip balm that moisturizes and nourishes the skin. Maintain a healthy food routine. Apply some clarified butter or coconut oil before going to bed to moisturize the skin on lips. Exfoliate regularly to remove accumulated dead cells. Be gentle while exfoliation or else you will cause more damage. Use lipsticks, lip gloss and lip balms with less or no harsh chemicals. Try the above mentioned remedies and bring the color and life to your lips. Do share your experience and suggestions in the comments section below. What makes a pink lips permanent?